I am so excited to share with you all that I am Helping World Market launch their fall collection! This is pretty much a pinch-me moment. I have worked with Cost plus World Market and their amazing team a few times in the past, and they asked me to help them launch their fall collection. Ummm, what?!! This meant I got a sneak preview of all of the new goodies that were not in stores yet. I was excited to see the colors and patterns, I was not disappointed! 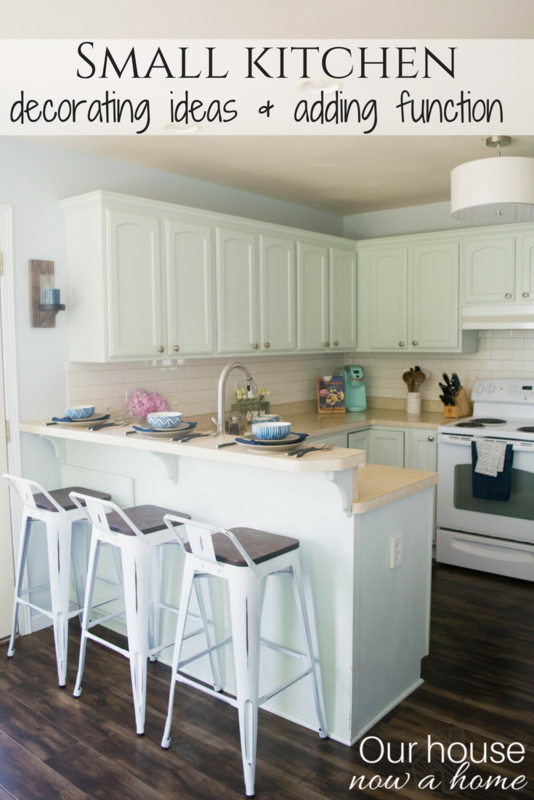 The best part about this collaboration is that my small kitchen was the perfect fit for this, World Market has a ton of small space furniture and decor items, my light and bright kitchen was in need of some function. I explained earlier this week that this space in my home is going through a small transformation, with plans for a massive overhaul eventually. 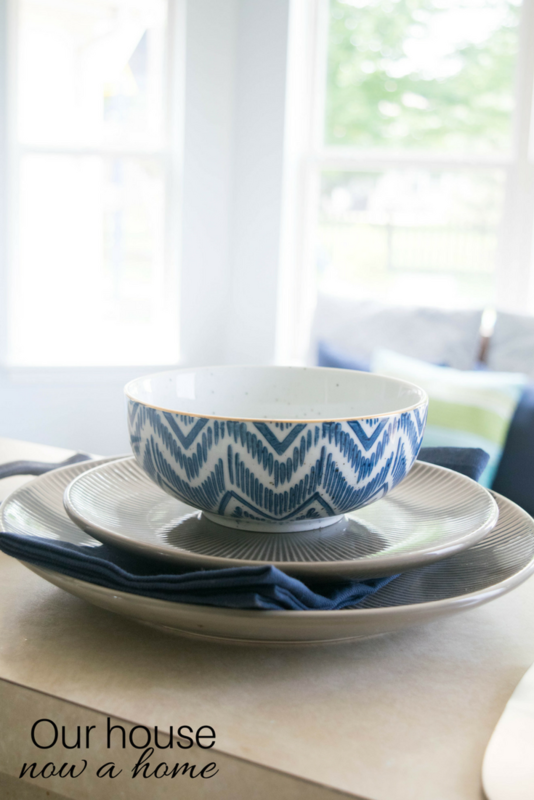 With the help of World Market I was able to utilize more of my kitchen and eat-in space, all of the details are in a guest post that I wrote being featured on their blog. You can find that here. I also shared a lot more pictures of my kitchen and links to every item I used from the fall collection and the small space collection within the post. This was an amazing opportunity, to not only create more function and style in my kitchen, but also to work directly with a brand and create content specific for their campaign needs. I had my kitchen set-up for a week, styling things and creating the final look. I adored every moment of improving this naturally hectic room for my family. Speaking of family, they were amazing during this process. Letting me style away, set-up, and photograph the kitchen. With each new endeavor for me that this blog brings it also brings new adventures for my family. This is first and foremost our home, but man my kids will have some stories to tell of their Mom decorating, styling, changing things up and photographing their home all the time. It is all worth it, we are slowly but surly carving out the perfect forever home for us, going room by room. Creating beauty, function, organization, fun and relaxation. This is our safe haven, our oasis. Our home has also created a career for me, which blows my mind. Helping World Market launch their fall collection is something I never would have thought I would get to do. Like I said, an actual pinch-me moment in life that I am so honored I had the privilege to experience. Be sure to check out my complete post on how I mixed function and style in my small space kitchen. All while drooling over the bold and modern new fall collection items! Lastly, thank you so much each and every one of you for coming along on this journey of me creating my dream home and establishing this blog. Seriously, you all make my day! Wow how fortunate are you to get a sneak preview. Would love to have that cart. Would go anywhere in my house and be perfect. I love that old looking cart you have in there. It gives character to the kitchen and function. Oh my gosh I love the kitchen! I am really trying to figure out what I want to do to my kitchen to update it and I think what is done here is absolutely gorgeous. That cart! Absolutely great! It gives the kitchen a very good twist. We will be updating our kitchen and need to start getting ideas. These are excellent. These are some awesome ideas, I’ve had a small kitchen in the last few homes I have been in and it is really hard to work with if you can’t use your imagination. I love seeing how your house is coming together. What an amazing journey. Can’t wait to see your next completed project. How exciting to get a sneak preview! I love the pieces you featured here and I look forward to seeing more! I’m also interested in the small space collection and will be checking out your other post linked above. I love the look of your kitchen. So pretty! I need to redecorate mine. It looks rather blah. What an awesome opportunity for you! I am in love with the kitchen cart. I am obsessed with World Market!!! I am in love with your kitchen! How exciting for you! Love all of the colors in the kitchen! I am totally swooning over that cart though!. 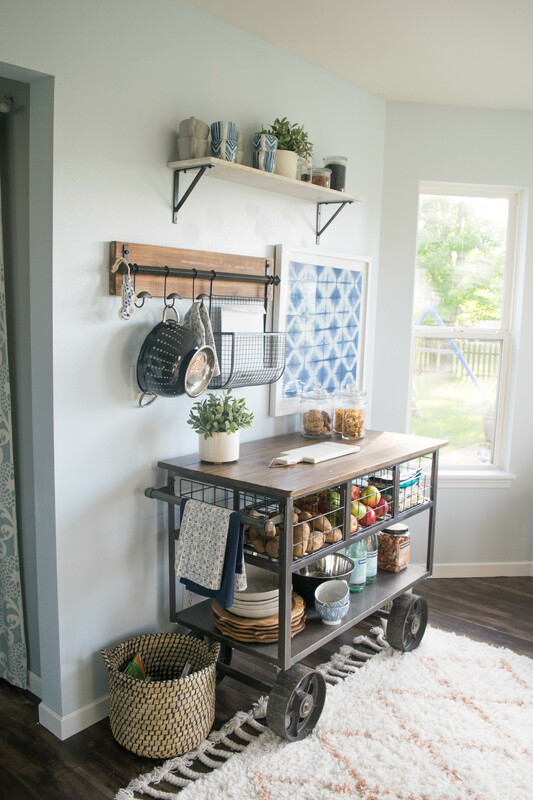 I’m loving the bar stools and the way you used the cart is just amazing! That’s such a cool way to organize! 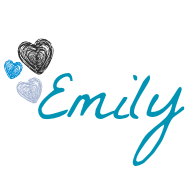 Ah congrats Emily! I love how reading your blog makes ME feel AT HOME, you’ve done an amazing job and what an honor to work with World Market multiple times. Just love seeing your sweet family and home, and you being so happy! Noting tips & strategies for Cheers Nature! So, it’s a House Now a Home, then we’ll all go outside for outdoor adventures! Ha. Congrats cuz! How cool that you got to help World Market launch their collection. I have always loved shopping at World Market for decor and cool foods. Congrats on workign with World Market. Your kitchen looks fantastic! Your kitchen looks like it belongs in a magazine. I love it! I need to check out World Market for some storage solutions for my home. Beautiful! Your kitchen is very unique and stylish. I love the cart as well. So dope to get a sneak peak. I’m so ready for fall, I have a few decorative projects I want to work on. I absolutely love that cart with the fruit! That is so clever and such a great use of space! Congrats on the sponsorship! I love World Market so many cute little things, I should utilize it more for home decor! I get a lot of my unique foodie and wine items here! That cart is gorgeous! I love anything that has style and also helps with storage! Love all of these decorating you are doing at your home, it is very inspiring. I love that shelf with wheels, that is so unique. Such a nice and beautiful kitchen you have. I love the simplicity you choose to decorate your small kitchen. Love the old cart you have there. What a fantastic opportunity! I would love to collaborate with World Market since I love their products. Congrats!!! 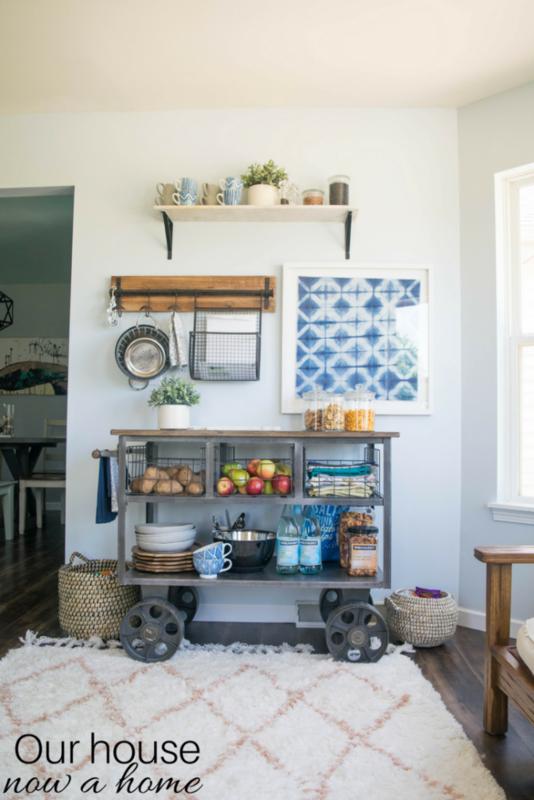 Your kitchen looks fabulous and I love that industrial cart! I think I am in agree-ance with everyone that cart! WOWZA it is the perfect thing for a small kitchen. Has functionality and design written all over it! Wow your kitchen is gorgeous I love that you kept it simple and focused on little pops of color. The wheel with shelves looks like my kind of decor that I have in my hallway, very cool! I can’t wait to check out all of the fall collection. You have a beautiful home, I love your decorations and decor. What a great opportunity. I love going into WM and seeing their new stuff, especially around a holiday. or new season. What a cute kitchen! i really love that cart! Adding a cart can add functionality and some great design to a little kitchen. I love that cart and how you made it functional. It gives the room a rustic but classy look and I love it! I like to keep coming back to this blog for decor inspiration. It is just amazing how you can make old things look really beautiful again. I love it! It looks so fantastic!